Astrophotographer Ron Brecher took this image of the Iris Nebula from Guelph, Ontario on September 10, 2016. Blue light seems to emerge from deep within the sky in this stunning image. Astrophotographer Ron Brecher took this image from Guelph, Ontario on September 10, 2016. This isn't the first time Brecher photographed the region. 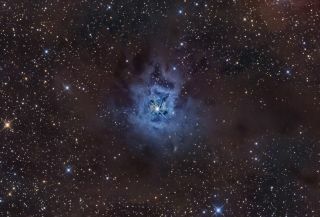 “The star at the centre of the nebula is easy in binoculars, but the nebula itself is very challenging to see visually. I imaged this object in 2013 but covered a relatively small field compared to this version, which does a better job at showing how dusty this region of space is,” he wrote in an email to Space.com.